This stone barn, built in 1918 and designed by architect Frank P. Whiting, was the centerpiece of Edward Severin Clark’s dairy farm. After Clark’s death in 1933, his brother Stephen C. Clark inherited the farm. He eventually offered the land and buildings for the creation of The Farmers’ Museum. Now, the Main Barn provides space for a variety of exhibits and visitor orientation. 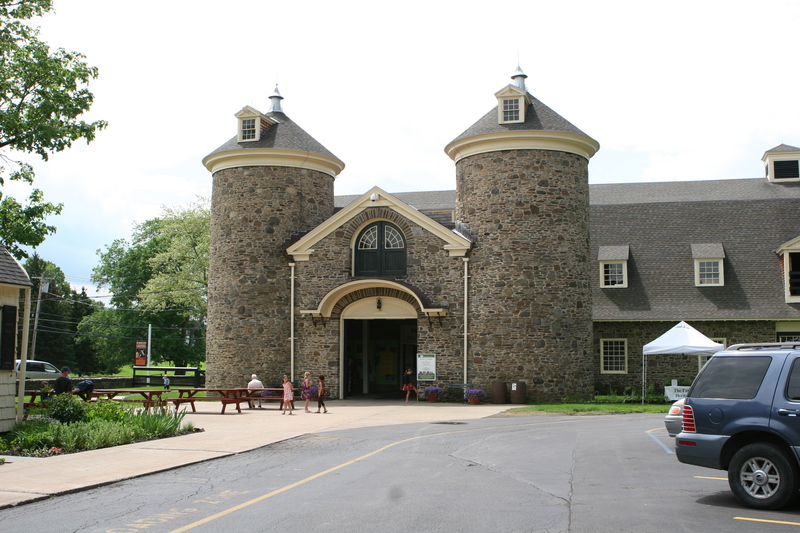 It contains self-guided exhibits intended to highlight aspects of life in rural upstate New York. The first floor exhibit space contains large exhibits that generally rotate every two years. The barn also houses the Cardiff Giant. Main Barn as the "Cow Palace"
Edward Severin Clark, a wealthy gentleman farmer, was a member of the Otsego County Agricultural Society. He promoted new breeding methods and technology to increase production on his farms, and he tried to be a leader for other area farmers. The barn had room for eighty cows in the milking area. 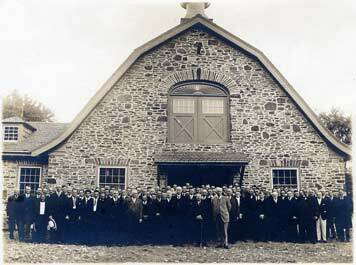 Considering local farms had an average of sixteen cows, Clark’s barn was considered a very fancy barn and was often referred to as the “Cow Palace.” Many farms in the region shifted to dairy farming in the early twentieth century when the hop industry suffered. The grand opening of the new cow barn at Fenimore Farm included a sit-down dinner for 150 people. 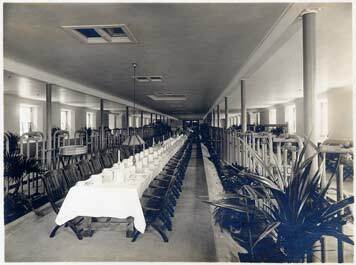 Guests sat at tables with white linens in the central aisle of the milking stalls on the first floor of the barn.